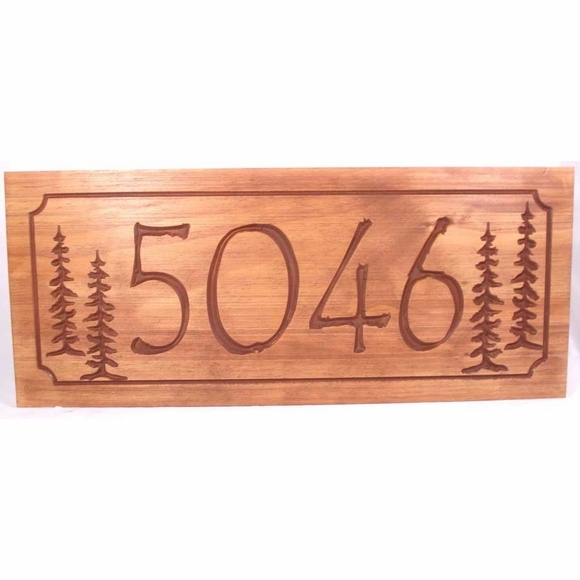 Carved Wood Address Plaque with Big House Numbers - - and pine tree accents. Personalized just for you. Wall mount. Made in USA. One line pine tree address sign includes two tall pine trees on each side. 18x7 sign holds up to five (5) large numbers. Please make sure to order the sign size that is big enough to hold your house number. (NOTE: you do not have to fill the entire input box.) Leave the two unused input boxes empty.